Govt cracks the whip against disgruntled leaders. Bengaluru: The state on Sunday cracked the whip making it clear that action would be taken against disgruntled leaders who skipped the Congress-JD(S) joint rally, attended by AICC chief Rahul Gandhi Saturday at K R Nagar in Mandya Lok Sabha constituency. CM H.D. Kumaraswamy’s son Nikhil is the coalition candidate in Mandya and is facing a stiff challenge from Independent candidate Sumalatha Ambareesh. KPCC president Dinesh Gundurao said he had also instructed senior partymen and ministers D.K. Shivakumar and M.B. Patil not to make any public statements on the Lingayat issue. 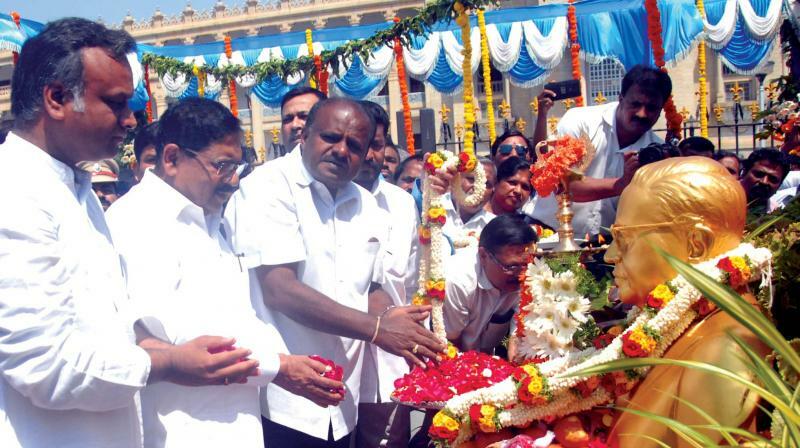 “On Mandya, we have already discussed what should be done. I have also held discussions with CM H.D. Kumaraswamy. We have come to a decision on what kind of action should be taken,” Rao told reporters here. “Not attending the event of Rahul Gandhi is a serious issue, we have to decide what action should be taken,” he said. With repeated efforts by CLP leader Siddaramaiah to tide over the opposition to JD(S) candidate Nikhil in Mandya failing, it was expected that Rahul’s participation in the joint coalition rally would end the stalemate and disgruntled party leaders would attend the event. But dashing the hopes of the state unit, several Mandya Congress leaders, including former MLAs N. Cheluvarayaswamy, P.M. Narendraswamy, and Ramesh Bandisidde Gowda failed to turn up. Upset over the party conceding the seat to JD(S), local Congress leaders and workers in Mandya have been strongly opposing the candidature of Nikhil and openly said they would not work for his victory, with most supporting independent candidate Sumalatha Ambareesh, who has the BJP's support. They cited Kumaraswamy himself not seeking their support as one of the reasons for staying away from the campaign for Nikil. With the alliance facing trouble in several key Lok Sabha constituencies of old Mysuru region, especially Mandya, AICC General Secretary K.C. Venugopal had recently warned of strict disciplinary action against those working against the coalition candidate. The party had on April 10 also suspended seven of its block presidents in Mandya for not toeing the party line. However,party sources said action against any leaders was unlikely till the elections are over, to avoid any adverse impact.